Lisa Simpson played the bari sax. And there was a bit of saxophone on the show for a while. Back when Bleeding Gums Murphy still lived. Here’s a lesson teaching you that riff. It starts on concert Bb as I’m playing it here, not the original key. But it’s an easy key to play on saxophone. It will be good for you to be able to play it in multiple keys. The point of learning musical ideas is to bring them into what you can play and you don’t want to be restricted by the key! Let me know how it goes and if you have any suggestions for the format. Cool, thanks Barry. 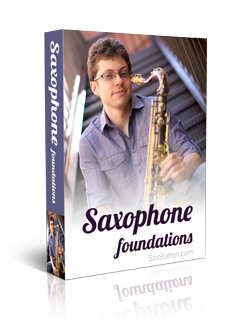 Figure there are plenty of books to read on saxophone. Bleeding Gums Murphy was a great character! A lot of it is personal preference. If there was a best kind, everyone would play it. Same thing for reeds. In rock you might need more volume, so a more open tip and a harder reed would each contribute to that. You don’t want the biggest tip opening possible and the hardest reed possible though since that would be ridiculous to play. Try out some different reeds and mouthpieces. Vandoren, Meyer, Dukoff, Berg Larsen are a few (but not the only) places to start for mouthpieces. Vandoren and Rico seem to be the most popular reeds. But where do you live? But getting the first two notes is still something. Can you tell if the third note goes up or down from the second note? From there you can try out some different notes. Slow down and take it one step at a time. Thanks Phil, what are some tunes you want to learn? Cantaloupe Island is a tune I go into. One has three different sets of scales that can be used in blues 1) Blues scale 2) Major Penatonic 3) Minor penatonic. There is only one note difference between the blues scales and the minor penatonic, So why not just use the blues scales? Is there any good method of learning the 12 blues scales? Do guitar play is all 12 keys or just certain ones? There are a lot more options than that harmonically when playing the blues. Another ‘flavor’ is to use diminished scales. It’s your call if you want to use the blues scale or minor pentatonic. Learn them one at a time. Guitar players tend to play more often in some keys but a good guitar player can play in all keys. I don’t have sheet music for it, I learned it by ear. This lesson should help you learn it by easier since it’s broken up and slowed down. If you want the sheet music, you can buy it.